I love seeing the historic pictures of Langlois posted on the website. I wonder if anyone has one of Whalen's Cafe which later became Stormy's, then finally became Gigi's before it burned. It would be great to do a feature on all that location. There are so many stories about what went on there but nobody ever had a smart phone or yelp back then I guess. If anyone has some images or stories to share we'd love to see them. We have a pretty good scanner any old pics would be neat and we can return the originals. Seeking Langlois Cadman Family from across the pond. My name is Gloria Cadman. I live in the North East of England. My Cadman ancestors, however, came from Suffolk in East Anglia, a region comprising the counties of Norfolk, Suffolk and Essex. Though geographically close to London, Suffolk was and remains a largely rural part of England. My grandfather was Jesse Cadman and he and his two older brothers, Herbert and Arthur, were born and brought up in the town of Wickham Market. Their parents were Arthur and Ellen (nee Woolnough).The boys were born into a family with a long tradition of farming, though Arthur Cadman was a stonemason. Of the three brothers, only the middle one, Arthur, stayed in Suffolk his whole life. He became a master saddler – in a county known for its horses, particularly working horses, this was a secure line of work. My grandfather, though a keen gardener, was also not inclined to follow his ancestors in working the land. Instead, he learned to drive and left Suffolk before the First World War, becoming first a chauffeur. Eventually, he and my grandmother settled in Buckinghamshire, where they raised seven children, and he managed the Taplow Bus Company, later absorbed into Thames Valley Transport. My father, Anthony, was the second child and oldest son, born in 1917. While my grandparents were alive they kept in touch with Jesse’s oldest brother who had settled in the USA, but that contact was lost when they and my father died. Jesse died in 1957, my father followed in 1973, and my grandmother Winifred died in 1979. All I could really remember was that there were people related to me with the name Cadman somewhere in Oregon, and that one of my father’s cousins had married a woman called Gloria, so at some point in the past there were two people called Gloria Cadman in the world! Only recently have I started a family history, using mainly a genealogy site called Find My Past. My grandfather’s oldest brother, Herbert, who was born in 1884, is recorded in the British Census of 1911. He is described as a ‘groom’, probably working for someone with an estate. However, he left England in 1911. I believe he went first to Canada, probably because travelling to Canada was cheaper that to the USA. In 1912, aged 28, he crossed from Canada into Vermont, USA. (He is listed in ‘Manifests of Passengers Arriving in the St Albans, Vermont, District through Canadian Pacific and Atlantic Ports, 1895- 1954, Nov- Dec 1912’). At some point he married Letitia, who according to the 1930 US Census, had also been born in Britain, possibly in 1892 or 1893, though according to her death certificate she was born on August 20th 1891. 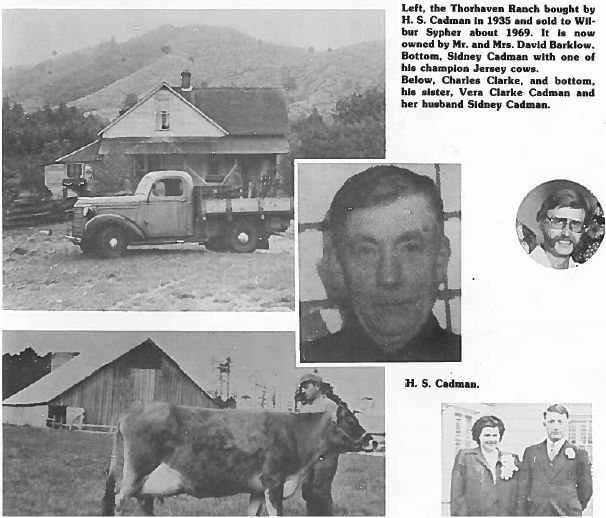 The 1930 US Census tells us that Herbert and Letitia were then living in Fat Elk, Coos County, Oregon, and had three children Sidney A. born in 1918, Edwin born in 1921 and Dorothy J. born in 1928. These three children were my father’s first cousins. However, by 1940 the family was living in Langlois, Curry County, Oregon. I found a record of Herbert’s death in 1975 and then the trail went cold. Read more about Seeking Langlois Cadman Family from across the pond. Langlois is older than Schitt's Creek ! So that's something! cool sign though .. https://en.wikipedia.org/wiki/Schitt%27s_Creek Read more about Langlois is older than Schitt's Creek ! This photograph appeared in the Oregon Journal on October 11, 1942, along with other photographs celebrating the efforts of local schools and organizations taking part in the nation’s first full-scale scrap metal drive of World War II. The scrap drive was orchestrated by the U.S. War Productions Board and the U.S. Office of Education and was promoted heavily by radio, newspaper, and motion picture companies. Rhyming slogans using “slap the Jap” like the one in this photograph, were common during the early stages of the war effort against Japan, when Americans hoped for a quick victory against an enemy perceived by many as racially and militarily inferior to Allied forces. Nationwide, approximately 30 million children collected 1.5 million tons of metal for the scrap drive, helping the War Production Board meet its quota. During the effort, a group of 33 students from Langlois, Oregon, won acclaim for gathering “an average of two and a half tons each”—a national record.